After davening on Tuesday, Rabbi Green formally welcomed the visiting Israeli exchange students from Yeshivat Makor Chaim (YMC). For the past nine years, MTA has sent 10-15 of its students to YMC for a 6 week, once in a lifetime, opportunity and received 4-5 students from YMC in return. After a one day delay in arrival due to an El Al piolt’s strike, the four YMC students – Zvi Blank, Eitan Dekel, Jonathan Lewis, and Ishai Lifshitz (or the “MC4” as they come to be known) – arrived, alongside the returning MTA students. Though Rabbi Green welcomed the Israeli students during davening, it was only the beginning of what was to be an inspirational welcoming ceremony. After davening, the entire 11th grade, were invited to a gala breakfast with the MC4. The breakfast consisted of bagels and cream cheese, orange juice and doughnuts, topped off with great Divrei Torah, songs and stories. Rabbi Kahn briefly greeted the boys and introduced Rabbi Taubes who talked about the opportunity MTA had at its doorstep; the MC students are ready to infuse MTA with their unique energy, enrich MTA Chagigot with new sparks of ruach, and ready to enlighten MTA students’ Shabbotot as they initialize their weekly kumzitz before mishmar every Thursday night. 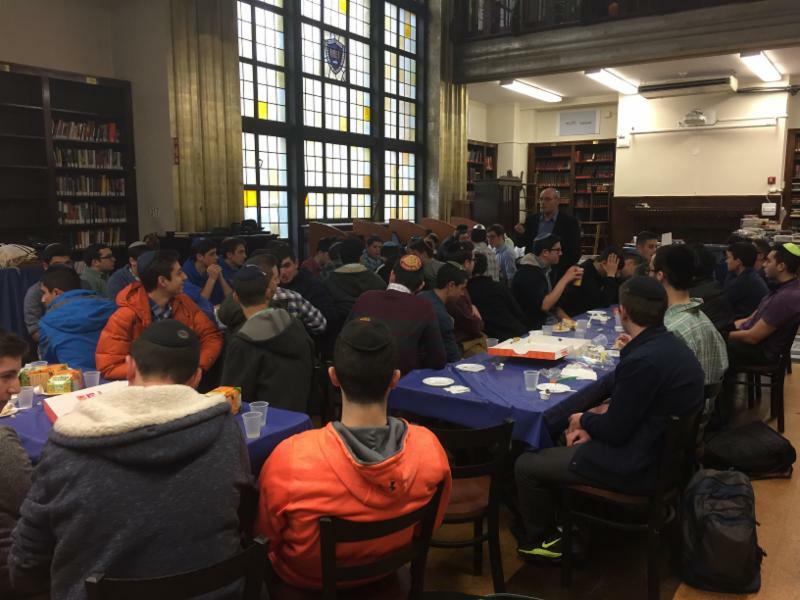 Rabbi Taubes mentioned that MTA has a great chance to learn and draw inspiration from the visiting MC students. 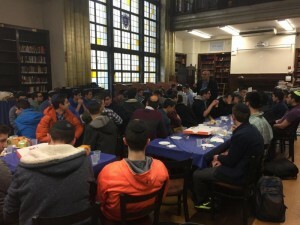 Yossi Baumol, Director of Development & PR for YMC who helped chaperone the students on their travel, described to the 11th grade the mission of Yeshivat Makor Chaim- namely, to find Hashem in davening and learning, but just as importantly, to find Hashem in friendships and emotional connections. He explained that this was MTA’s opportunity to learn from the Israeli students what YMC has instilled in them and to grow as a school. Finally, the Makor Chaim exchange students spoke. They related a story written by Rebbe Nachman sending the message that although MTA is ready to learn from them, they are just as ready to learn from MTA. Rabbi Mendelson, Maggid Shiur of the 11th grade shiur in which the MC4 will spend the next 5-6 weeks learning, ended off the event by teaching everyone a song. Though it was only the beginning, the 11th grade was inspired and excited for the next six weeks!